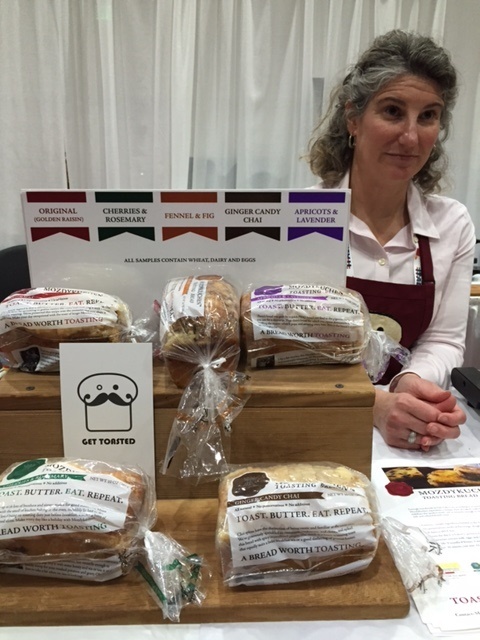 Last January I made my rookie appearance at the Winter Fancy Food Show in San Francisco. To say it was overwhelming would be an understatement. The show, owned and produced by the Specialty Food Association (a not-for-profit trade association for food artisans, importers and entrepreneurs) takes up 215,000 square feet at the Moscone Center, a pair of cavernous exhibition halls. With 1,500 exhibiting companies from all over the world presenting their wares in booths with X Banner Stands, you cannot possibly absorb it all in one visit. The show lasts three days, so taken in small-to-medium size bites (or sips) one can get a better sense of the territory, and make decisions about where to linger, where to pass quickly, where to stop for a chat, and where to go back and get one more taste of whatever they’re handing out. As with 2015, several items were presented in abundance this year: if you could pour it, spread it, sprinkle or drizzle it, dunk or dip chips into it, slice it and put it on a cracker, add hot water to it, drink it straight, or eat it by the handful — the options were limitless. Popcorn, jerky, all manner of seeds, vegetables in chip form, anything with coconut or blueberries as an ingredient, kale (still) and turmeric: yes, they were everywhere. New ideas? There were several worth considering as the wave of the future. One example: Caboo‘s traditional paper products made from bamboo and sugar cane. It kind of makes sense; if you’ve ever tried to get rid of bamboo, you know how cutting it down only encourages it to grow. Tapping into it as a resource and saving trees in the process seems like a good idea. I didn’t get close enough to feel the products, so I can’t say whether they measure up to the softness one expects from these sorts of things, but I’d be willing to give them a try. The Nutraw Foods Pistachio Raw Bar. It’s organic, non-gmo, gluten free, vegan, and kosher, no less. This bar was made from five ingredients, mostly sourced from local California farms: organic dates, organic pistachios, organic almonds, organic extra-virgin coconut oil and organic green cardamom. It’s naturally sweet, and crunchy with nuts. A tasty combination — each element is in every bite. This company also makes other raw snacks, raw butters and two kinds of oils: pistachio and almond. While I don’t normally inhale pistachios like some folks do, I liked the texture, the sweet taste of the dates, and, yes, the hint of coconut and pistachio in this bar. Mozdykuchen (mahz-dee-koo-kin), described as “old world brioche sweet breads.” This bread is designed to be toasted, griddled or grilled. Keep this one in mind during April, which is National Grilled Cheese month. I tasted a small, just-toasted piece, and would definitely buy a loaf if I can find it locally. The breads are made without preservatives and are about half the size of a regular loaf of bread. I spoke with Suzanne Mozdy (she and her husband were there representing the family recipe) for a few minutes, and heard a little of the history of Mozdykuchen. She recommends keeping it in the freezer and pulling out a few slices at a time. If hot buttered toast is one of your comfort foods—or if just hearing the phrase “hot buttered toast” makes your mouth water—you will love this bread. So, so good. Big scoop from San Francisco’s family-owned Double Rainbow Ice Cream: it is launching a new line of frozen custard and fruit ice, layered together or sold separately. Double Rainbow originated in San Francisco 40 years ago this September, and to celebrate the family is releasing a line of frozen custards, fruit ice and malts—available in the spring. Frozen custard flavors include: chocolate and vanilla malt, sea salt caramel, and original vanilla; the five custard and fruit ice combos feature original vanilla custard with blueberry pomegranate, strawberry lemon, mango tangerine, raspberry, and tart cherry fruit ices. Lafaza Foods vanilla products from Madagascar. I chatted with James Delafield, a member of the Lafaza team, and learned some of the history of vanilla farming on this fascinating island off the southeast coast of Africa. Lafaza is a small, family-run business based in Oakland. The team emphasizes organic and sustainable practices in its business, which produces extracts, ground vanilla and vanilla beans. I enjoyed our conversation and came away with more than just a small sample of the vanilla. Hella Bitters. All the way from Brooklyn comes a company with a name straight out of Oakland. The co-founders readily admit that one of them is from Oakland and acknowledges the source. 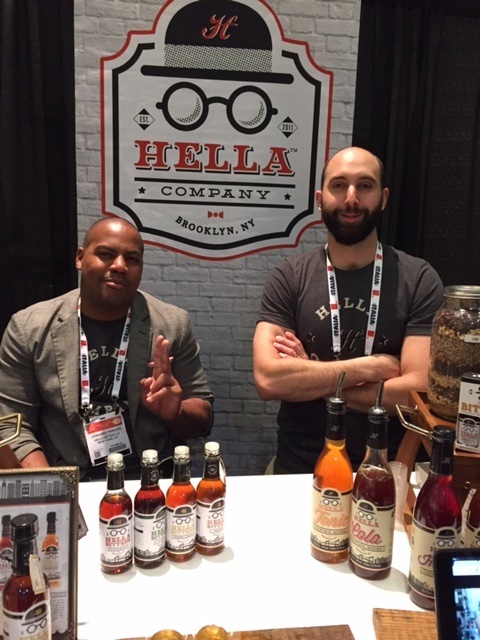 I spoke with two of them, Tobin Ludwig and Jomaree Pinkard, at their display and heard more about Hella’s products: “a variety of handcrafted goods that raise the bar on your imbibing and culinary experience.” The bitters come in several flavors: Citrus, Orange, Smoked Chili, Aromatic, and Ginger. They also offer kits for the home bartender: The Craft Your Own Bitter Kit (comes with essential tools, their proprietary mix of spices, bittering agents and dried fruit peel). You can follow the instructions, or get creative and add fresh ingredients of your choosing. The other kit sounds like fun: The Old Fashioned Kit, which comes with special cocktail sugar cubes (made from Demera pure cane sugar) and bitters, a muddler and a jigger. Just add whiskey, ice and an orange peel—and you have created the quintessential cocktail. Tea Drops. What are they? All organic, dissolvable, shaped tea. The flavor varieties come in several different shapes: Cardamom Spice is a star; Rose Earl Grey is a flower, Chocolate Earl Grey is a square (as is Matcha Green Tea, which is green), Sweet Peppermint is a heart, etc. Tea Drops eliminate the need for tea bags and loose leaf tea. All you need is a cup and some hot water. I tried the Citrus Ginger (another flower shape) and thought it was terrific. This tea, as described in the materials I picked up, is “A delicate fusion of the sweetness of freshly squeezed oranges with the subtle, yet powerful zing of crushed ginger.” It’s made from citrus rinds, citrus extracts, finely crushed ginger, peppermint and organic sugar. 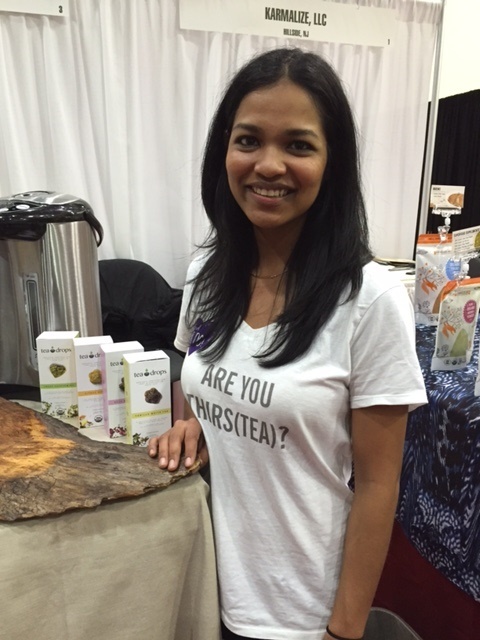 I spoke briefly with Sashee Chandran, creator and founder, and asked how she came up with the idea. Influenced by her Sri Lankan and Chinese roots, she wanted to simplify the process of making tea while sharing her love for it, she said. This is a creative concept I think people will really like. True to its name, Simple Mills is simple: a variety of baking mixes made with almond flour, coconut sugar, arrowroot powder, coconut flour, baking soda and sea salt. The sample muffins they were handing out (banana and chocolate) were moist and delicious. For those who have dietary restrictions, Simple Mills products are “free of gluten, grain, dairy and soy.” The founder of the company is a young woman inspired by her own health concerns to create these mixes. Simple Mills agreed to share some recipes with us. Wei Kitchen specializes in making a small number of Vietnamese and Asian-inspired products, including shallot oil, which I tried and found very flavorful. This turned out to be one of the Top 5 trend-related items below. Twang Beer Salt. I will admit I did not know that this was a thing. But it’s been around for nearly 30 years, so there you go. 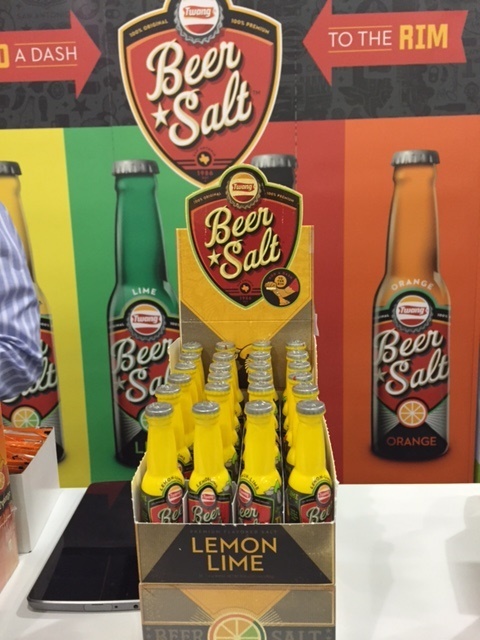 Adding a dash of citrus salt to your beer is a nice touch. You can go spicy or mild, and it’s just like adding an orange wedge or a chunk of lime to your beer without the slicing and squeezing. Perhaps my favorite taste of all was a small sample of Certified Piedmontese Beef® that reminded me of the delicious bistecca I had in Florence too many years ago. Naturally tender and full of flavor, even the smallest bite brought back a delightful memory. They offered us two delicious recipes. Every year at the end of the show, a panel of experts identifies the Top 5 trends in food. This is something people look forward to, and it’s always interesting to see if you spotted any as you wandered through the aisles and displays. Last year’s trends are still in the mix: breakfast foods, like pancakes, along with cheese, bacon, turmeric and coconut; vegetables, grains and legumes that have been coerced into chips, and flavored waters were all well-represented at this year’s show. In terms of acreage, however, popcorn, candy and jerky still rule. Wishing all success to the innovators who came up with an idea or followed a dream and had the chance to share it with 19,000 visitors. Note: At the end of the show, exhibitors donated thousands of pounds of meat, cheese, produce, confections and snacks to Bay Area soup kitchens and food pantries in partnership with Feed the Hungry, an anti-hunger organization. Risa gathered these recipes for EDF readers. Risa Nye lives in Oakland. Her articles and essays have appeared in the San Francisco Chronicle, The Monthly, Hippocampus magazine, and several anthologies. 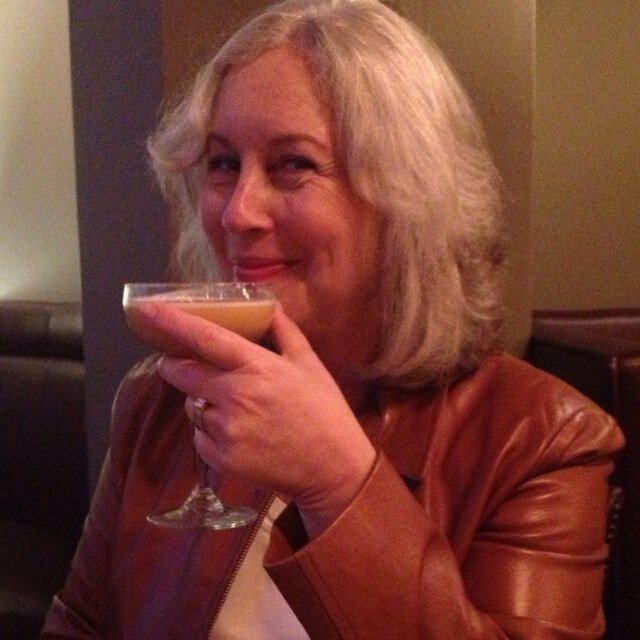 She writes about cocktails as Ms. Barstool for Nosh at berkeleyside.com and about other things at risanye.com. This entry was posted in Eat and tagged Eat, Fancy Food Show, Risa Nye. Bookmark the permalink. RAMBLINGS ON THE OSCARS 2019-Or is it 2018 Awards Given Out in 2019? IS ROMA A GAME CHANGER?